The U.S. Senate this week gave up on the effort to repeal the Affordable Care Act and replace it with a different federal approach to healthcare. An assessment of available public opinion data suggests, however, that this failure to repeal Obamacare will not be upsetting to the majority of Americans. While the public sees flaws with the ACA and is open to changing it, only a minority of Americans in our latest assessment want to see the ACA repealed and replaced, as has been the case for a significant period of time. The rest either want it kept as is or want it kept but with changes. The effort by President Donald Trump and Senate leaders to repeal the ACA does reflect the views of their party's voters, who endorse repealing the law, but not the majority wishes of the public as a whole. That's not to say there is an overwhelming level of positive feelings for the ACA. Approval of the law fluctuates around the 50% mark, as it has for a long while. 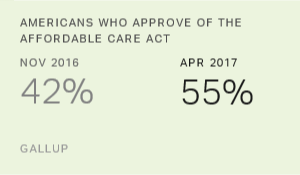 Gallup's latest survey conducted in July shows that 53% approve of the ACA. A more recent tracking survey conducted in September by the Kaiser Family Foundation shows approval a little lower, at 46%. The public's assessments of their own healthcare show there is perceived room for improvement. Three-quarters of Americans are OK with the quality of the healthcare they receive, leaving a quarter who are not. 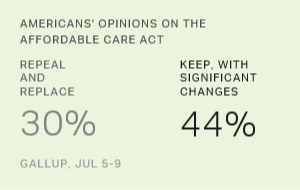 Over six in 10 Americans are satisfied with their healthcare coverage. Over four in 10 express dissatisfaction with the cost of their healthcare. Americans' likelihood of mentioning healthcare as the nation's most important problem has risen in several recent months as the ACA has been debated in Congress, but prior to that, we haven't seen healthcare as a major top-of-mind issue among Americans for years -- compared with the number of mentions of government itself or economic problems as a whole. All in all, the direction from the public on healthcare reform is to tweak the ACA but not necessarily to go to great lengths to "replace" it, although the distinction between making changes and repealing it may be more terminological than real. It's hard to find data supporting the idea that tax reform is a top priority for Americans. Just 2% mention taxes in our latest monthly assessment of the most important problems facing the nation. There is, however, a measurable dissatisfaction with taxes that suggests Americans may be receptive to tax changes if leaders propose them. 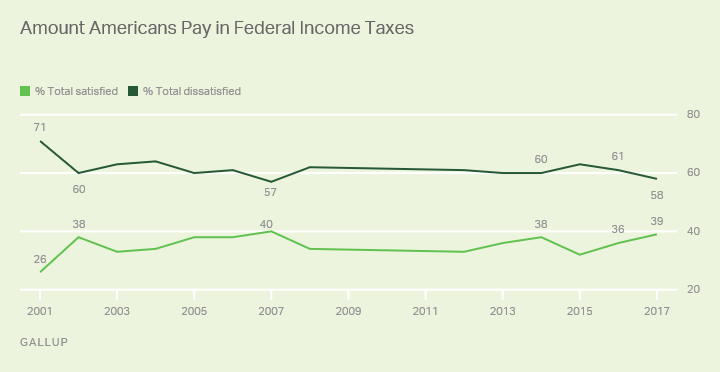 Earlier this year, 39% of Americans told us they are satisfied with the amount Americans pay in federal income taxes, meaning that a majority are dissatisfied. Looking back, we see that satisfaction rose modestly after the Bush tax cuts in 2001-2002 and is up a little this year compared with the previous two years. But the majority of Americans are still dissatisfied. 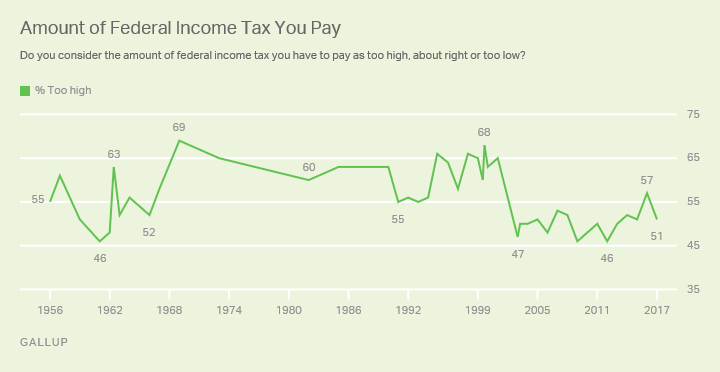 A slight majority of Americans say the amount of federal income tax they pay is too high, but this is down from many points prior to the Bush tax cuts. The "too high" percentage was as high as 69% in the late 1960s and was at 68% as recently as the late 1990s. These data, as noted, suggest some public receptivity to the idea of dealing with taxes. Along these lines, a recent CNN poll showed that 68% of those interviewed said the federal income tax system needed a complete overhaul (35%) or major changes (33%). In terms of specifics, previous Gallup research has shown that Americans with an opinion are substantially more in favor than opposed to the idea of reducing the number of income tax brackets (in the example we used, from seven to four) and strongly in favor of a "middle-class tax cut." So these central components of the proposed changes look like they are OK with the public. However, the idea of a plan that results in tax cuts for the wealthy would not play well with the public, given that Americans think that upper-income Americans pay too little in taxes now. President Trump is apparently aware of this, stressing in his tax reform speech in Indiana this week that, "Our framework includes our explicit commitment that tax reform will protect low-income and middle-income households, not the wealthy and well-connected," although some observers claim that both the wealthy and Trump personally could benefit from the plan. Our research also finds Americans saying that corporations pay too little in taxes, suggesting that public opinion may initially be negative about a centerpiece of the proposed plan, which, as outlined by Trump, will focus on cutting the corporate tax rate to as low as 20%. A Washington Post/ABC News poll showed support for lowering taxes for "businesses" was just a little lower than opposition, perhaps reflecting a more positive connotation with the word business than with the word corporations. All in all, the direction from the public on taxes is that it's OK to reform the federal tax system and that reducing taxes on the average American is always a good thing. However, cutting taxes for upper-income Americans or corporations and big businesses is going to need a lot more explaining before it is acceptable. And overall, tax reform is not the public's highest priority. My reading of public opinion is that Americans want more than anything to see changes in the way government operates, particularly Congress. And critically, people want their elected officials to compromise and not stick to rigid principles or ideologies. Beyond that, people are always focused on jobs, although the public says that the employment situation is improving. Spending more on infrastructure is a top priority for Americans as well, but that appears to have been lost in the shuffle for the time being. 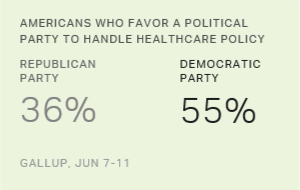 Americans will go along with changes in the healthcare system as well as with tax law reforms if they are explained carefully and seem to do more good than harm -- but neither of these seems to be the public's highest priority. While skeptics have a point in doubting tax reform can happen this year, the president, and now Paul Ryan, insist it will. Public support for middle-class tax relief, particularly from the GOP rank and file, works in reform's favor.